Use pastel backdrops, rich accent shades, floral patterns, and plush textures to create feminine bedrooms, which personify elegance and sophistication. Your bedroom is your personal sanctuary, a space where to relax and renew, a space where to express your personality and create a serene yet sophisticated hub. The blend of the color scheme, decor, décor, and the overall ambiance the space exudes can lend your bedroom a feminine or masculine vibe. Masculine bedrooms are with rigid, straight lines, in grays, black, and brown, and décor without unnecessary frills. 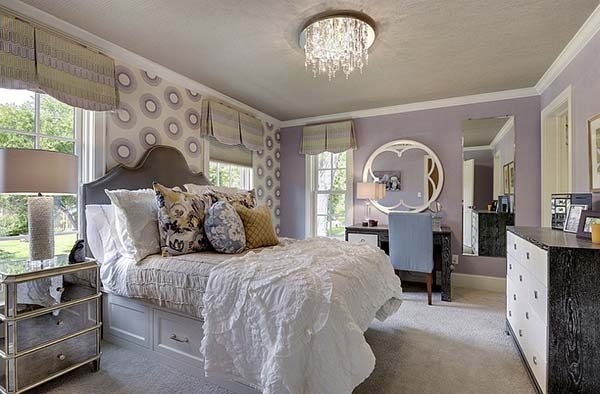 Usually, pastel backdrops, rich accent hues, floral patterns, and luxe plush textures characterize feminine bedrooms, which by definition exemplify elegance, gentleness, and sophistication. If you like feminine bedrooms, find inspiration how to lend your personal retreat this refined look. Keeping the backdrop relatively neutral allows using plenty of lovely hues and accessories without limitations. Furthermore, with a neutral backdrop you can easily change between hot colors and decorating trends. Hot pinks, shades of aqua, turquoise, purple, and greens are options to choose from when it comes to creating a space with feminine touches. Wallpaper with floral patterns or nature-inspired motifs is also a popular choice. 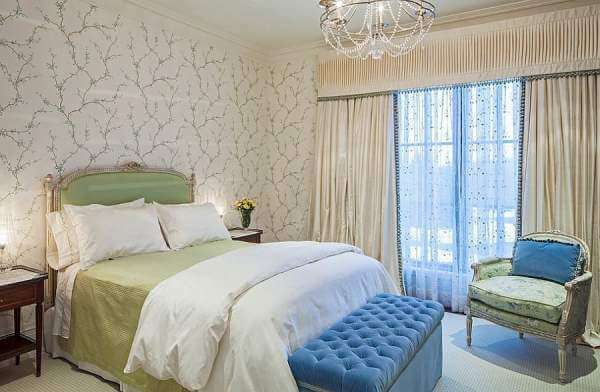 Throw pillows and bedside tables with floral displays complement the graceful look of feminine bedrooms. Contemporary spaces are usually in neutral colors, with simple, straight lines, and unassuming decor. On the other hand, feminine spaces call for color and creativity. In this regard, finding the balance between a contemporary bedroom and one with a feminine vibe can be a demanding task. Luxurious fabric, mirrors, mirrored pieces of furniture, tufted headboards and benches, and fresh flowers add elegance, luxe, and sophistication and complement the feminine vibe. As these colors are neither monotonous nor overwhelming, they help create a relaxing and exciting personal retreat. Add dashes of pale gray for touches of refinement. “Tone-on-tone” decorating also works well in feminine bedrooms. However, it is always up to your taste and preference how to decorate your personal retreat.